Krazy About Tatting Shuttles: Thanks for the help. Thank you Melissa for helping me with this pattern. While going through your corrections and suggestions, I also found one more. 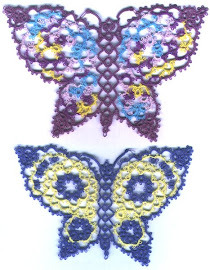 I have posted the butterfly pattern on my website/contacts page and have tried to link it here. Not sure why but sometimes the links work and sometime they don't. This pattern was derived from two vintage tatted butterflies not from the original written pattern. If anyone knows the original author and publisher, I would be grateful to have it and credit them. Thank you, Heidi, and Melissa. Although it looks familiar, I haven't found it in my pattern stash yet. I'm anxious to try it again using your edited instructions-- unfortunately, that has to wait this time until I get I get a birthday gift completed. I have to get ready for work so I don't have time to look further, but I think one pattern was from an old Needlecraft and one from Workbasket. I have the one right here in front of me that I tatted several years ago in an album but I didn't write in here where it was from. I'll find it later. I found the workbasket butterfly on my blog. It doesn't say which workbasket but it was a doily which was surrounded by this butterfly. I want to say 1957 but that might not be right. I'm not sure it had a name on the pattern either.